SOMETHING EXTRAORDINARY HAPPENED while we weren’t looking: business caught up with science fiction. 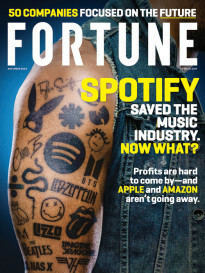 That’s the message of Fortune’s cover package this issue—which explores how companies around the world are streamlining, speeding up, error-proofing, and otherwise reinventing their daily operations with the help of a versatile, futuristic tool. Financial institutions such as HSBC and Danske Bank are using it to get better at fighting money laundering and fraud—and a slew of mortgage lenders already use it to predict loan default rates. Vodafone, Nielsen, and Unilever are using it to find job applicants with more fine-tuned social and emotional sensitivities. And Airbus used it to design an interior partition on its A320 jet—arriving at a structure that was scarcely half the weight of the previous version. That tool is artificial intelligence—or A.I., as it’s now universally known. And though its capabilities and limitations are only barely understood, companies large and small aren’t waiting to test it out. Home Depot is feeding vast amounts of store transaction data into a deep-learning algorithm to help figure out what’s frustrating do-it-yourselfers (and what else the store can sell them to fix the problem). BMW and Mercedes-Benz are using A.I.-fueled collaborative robots, or “cobots,” to turn their human car assemblers into “Ironman” superworkers. And Swiss investment bank UBS teamed up with IBM Watson and a New Zealand startup to “digitally clone” its chief economist Daniel Kalt so that the avatar Kalt could “interact with clients just as he would in the flesh,” Fortune’s McKenna Moore reports. For this special package, our reporting staff delved deep into the industries they cover to learn more about how A.I. has been transforming business. We highlight 25 great examples, but you’ll find others as well throughout the issue. In an introductory essay to that package, A.I. pioneer and venture capitalist Kai-Fu Lee, who is also a veteran of Apple, Microsoft, and Google, says we’re now immersed in not just one wave of A.I. but rather four simultaneously—each “with different starting points and velocity” . The A.I. feeding off the vast repository of Internet data is driving a second wave of business process–focused A.I., which is being enhanced further by a wealth of sensors that are now giving intelligent machines the ability to hear, see, and feel. Together, these three waves are building to an age of “autonomous A.I.” That, of course, is the realm of self-driving cars and other autonomous devices—machines that can make decisions about how to move themselves through space. This sudden confluence of machine-learning advances, Lee acknowledges, comes with no shortage of challenges for us slower-learning humans—from issues of privacy and security to inherent biases and unavoidable job displacement. But as our special report reveals, this new algorithmic science is also making business smarter, better, and more efficient in the process. Some companies, naturally, are more poised to embrace the future than others. 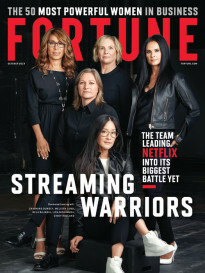 As Fortune discovered with the help of consultancy BCG, there is something in the DNA of forward-thinking firms that drives them to invest proactively in their businesses, adapt quickly to change, and attract workforces that have that same mindset. For the second year in a row, we’ve highlighted dozens of those companies—a list we call our Future 50. At the very top of that ranking is enterprise software-maker Workday, run by cofounder Aneel Bhusri. So what exactly gives this California company a line to the future? That’s where the supernatural intelligence of Fortune executive editor Adam Lashinsky comes in. Enjoy tomorrow. It turns out it’s already here.